Available in very limited mintages are the 2014 $200 Bald Eagle Protecting Her Nest Gold Coin and the 2014 $20 Bald Eagle Returning From the Hunt Silver Coin. 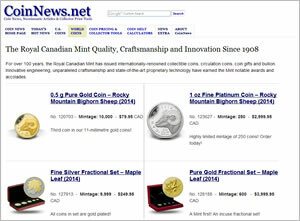 Listed mintages are 350 of the gold coin and 7,500 of the silver coin. 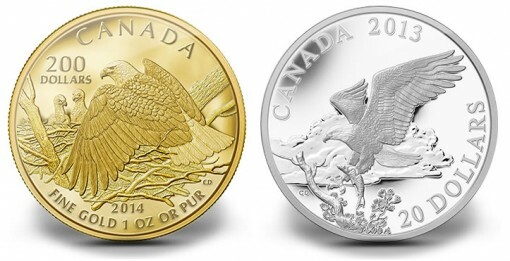 Created by Canadian artist Claudio D’Angelo, both coins feature reverse designs of bald eagles in their natural habitat. 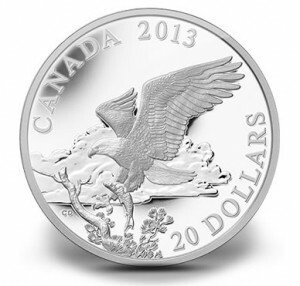 "Canada’s largest bird of prey — the bald eagle — is an amazing apex predator whose adult members have no natural enemies that hunt it in the wild," describes a news statement from the Royal Canadian Mint. "This massive raptor has a wing span exceeding 2 metres, a standing height of about 1 metre, and an average weight of up to 7 kilograms. Females are generally larger than males." Bald eagles are known to inhabit areas of Alaska, Canada, the contiguous United States and even parts of northern Mexico. Gold coins feature reverses of a female bald eagle protecting her two young eaglets. The female adult is shown perched on the edge of her nest with wings slightly spread. Inscriptions read "CANADA," "200 DOLLARS," "2014," "FINE GOLD 1 OZ OR PUR" and the artist’s initials of CD. Each coin is struck to proof quality from 99.99% pure gold. Specifications of the strike include a weight of 31.16 grams, a diameter of 30 mm and a serrated edge. Susanna Blunt’s effigy of Queen Elizabeth II is shown on the obverse. Inscriptions include "ELIZABETH II" and "D G REGINA." The Royal Canadian Mint encapsulates each coin and ships them in a maroon clamshell case. The silver coin features a reverse of a single adult bald eagle about to land on the branch of a tree. In the bird’s left claw, a freshly caught fish is depicted. This coin is the third release in the Mint’s four-part series of silver coins featuring the bald eagle as seen from four different perspectives. Reverse inscriptions include "CANADA," "2013" and the legal tender face value of "20 DOLLARS." Shown on the obverse is the Susanna Blunt portrait of Queen Elizabeth II along with the inscriptions of "ELIZABETH II" and "D G REGINA." Each also features edge lettering of "FINE SILVER 1 OZ ARGENT PUR 1 OZ." The coin is composed from 99.99% fine silver, have a weight of 31.39 grams and a diameter of 38 mm. Like the associated gold coin, each silver strike is encapsulated and presented in a maroon Royal Canadian Mint display case. Serialized certificates are also included. 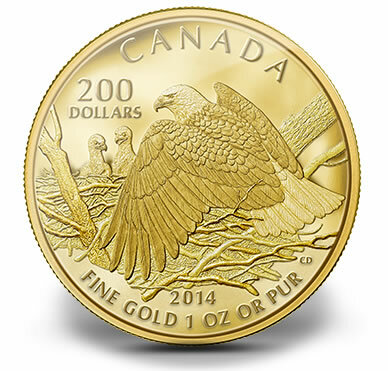 To order the 2014 $200 Bald Eagle Protecting Her Nest Gold Coin or the 2014 $20 Bald Eagle Returning From the Hunt Silver Coin, contact the Royal Canadian Mint via the website of www.mint.ca or by calling 1-800-267-1871 (Canada) or 1-800-268-6468 (US). 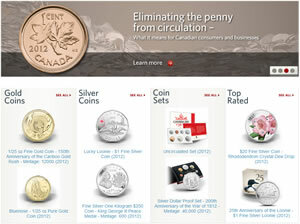 Pricing is CAD $2,699.95 for the gold coin and $99.95 for the silver coin.